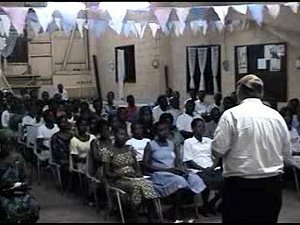 During the first seminar with local pastors in Ghana, West Africa, Dr. MacWilliams asked the pastors how many had ever worked with missionaries ?" None of them raised their hands. He then asked, "How many of you KNOW missionaries ?" Again, there was no response. 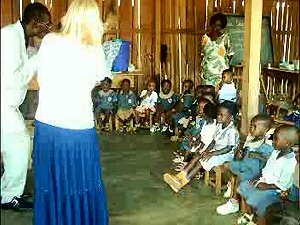 Then, he asked them, "How many of you have heard about missionaries in your region of Ghana ?" This time two pastors raised their hands and explained that the missionaries they knew about did little to contribute to ther life of the churches and were not favored by local pastors because it seemed that they had their own agenda. This confirmed Pastor MacWilliams' own personal experiences in South America, where many missionaries were supposed to be working in the Medellin area. One day, he visited a Baptist church in a poor and rough neighborhood. He was given a tour of the facilites which were maintained by donations from the United States. The pastor-missionary noted the nice paintings and desks which had been brought there in the past year. However, not once did he say anything about what efforts--if any--were brought to bring souls to the Savior. Dr. MacWilliams turned to his business acquaintance who was standing nearby, and asked, "Do you know of any Christian missionaries in this city ?" He pointed across the street to a crowd of people (more like a mob gathered outside a bar). "Are they over there ?" he asked. "Look past the people. See the high wall with glass and barbed wire ? Your missionaries live inside there." When he asked, "Do they try to preach to all those people on the street ?" the businessman replied, "No." "They stay inside the walls in the wealthy section where they hold Bible studies for the rich children once a month." While not all missionaries fit into this mold, it is a certainty that the Western concept of Christian missions leaves much to be desired, and it is not Biblical. Having seen the lack of impact in Africa, Dr. MacWilliams began teaching the churches an approach to the Great Commission which the early Church used. Using local pastors and churches (where they do not have to spend four or more years studying a foreign language), he told the pastors to find those within their own churches who were called to evangelism. Form Gospel teams and hold evangelistic meetings to bring the lost to Christ. In each area outside the "mother church," they should see new converts to the Faith. Immediately after these meetings, the new converts should be immersed in the fundamentals of the faith. Evangelists and others from the "mother church" should instruct them from the Bible intensely for two or more weeks...every day. At the end of that time, they should decide upon forming another church, composed of the recent converts. Under the guidance and watchfulness of the originating church, these new churches began to appear. Today, there are over 200 new churches which have begun in this way. In each new church, they Lord will either bring to them, or call out for them people who have been called by God and given gifts which the church will need to grow and prosper spiritually. This more Biblical approach to missions has not only resulted in many new churches, but it has enriched and strengthened the churches which have followed this Biblical plan. Today, many of the churches which are only a year or more old have themselves begun to reach out with the Gospel message to towns and villages, bringing more and more precious souls to the Lord Jesus !